Between 1983 and 1989, Domi Emorine won twenty-four prizes as a child prodigy. In 1990, not yet fifteen years old, she won the World Accordion Championship and the UNAF prize. In 1991, she won the Silver Medal; and in 1993 the SACEM medal in the 'Voice and Wind' category. Five years later, Domi won the World Championship again. She also did something unique in the annals of accordion playing: she won the 'Grand Concours International en Divertissements et Variétés' (International Entertainment and Variety Show Contest) for the third time. 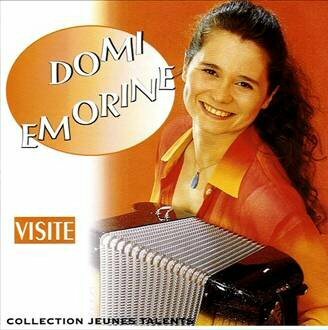 Domi also won First Prize at the International Contest in Klingenthal, thus becoming the only female accordionist to have won the three most prestigious international contests. This audiofile is a sample from her album, 'Viste'.